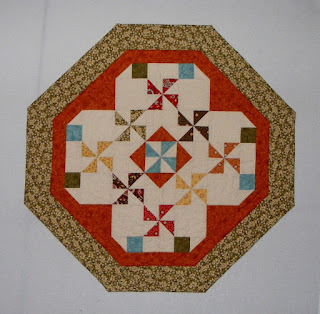 Quilting Adventures: Spin, spin and more spinning ...! How did the week go by so quickly? Sigh! Oh well. I've been quilting away and actually have pictures of a finished project to show you. I've been working on this little quilt, more like a table topper. The pattern is called A Little Twist by This & That, designed by Sherri K. Falls. I had a fun time putting it all together! I used fabrics from Moda, Simple Abundance designed by Bonnie & Camille . Ya know, that picture does not do justice to the orange. It's much prettier than in the photo. Now that this little quilt is done, I'll be looking into making some Schnibbles patterns by Miss Rosie's Quilt & Co. I've seen them on Darlene's blog and they are enticing! What the heck! Quilting is suppose to be fun and fun I'm having. Don't forget, today is the last day to leave a comment for the give away. Good luck to all that commented. Thank you for stopping by my little corner of cyberspace! Keep well! Cheers! Lovely quilt...nice to hear you are having fun! Great little table topper! Those Schnibble patterns look addictive.. Bet it would be hard to make just one! Of course this is all about having fun. I like your table topper. It is a beautiful little table topper. I think you will love the Schnibbles. They are quick and fun to make up AND they turn out so cute. What a sweet quilt, Carole. I love it. Time to do a Schnibble or two. teehee! Your tabletopper is so cute. Love the colours in it. I really love your table topper, such pretty colors. It's beautiful! I always love pinwheels! It is a great little quilt- you have been one busy girl as usual. There are so many great patterns and quilts to make and never enough time. yeah, why do those schnibbles look so much more fun on Darlene's blog! Everytime I see one on her blog I think - I have to make that! Now this is one fun looking table topper! Oh gosh if you like Schnibbles you should spend a bit of time and go back through some of my older blog post...oh and today I have one too! I've also got them stacked to quilt for customers! Fun stuff! Do jump in and make yourself some!! That little table topper is adorable Carole! I love pinwheels -- I keep thinking I'll get sick of them, but it never happens! Did I make it in time??? Love the table topper!